Update— August 30, 2013: The gun charges against Hashim Nzinga have been dropped. Hashim Nzinga, longtime member of the New Black Panther Party (NBPP) who has a history of advocating militant action, has been arrested and charged with possession of a firearm by a convicted felon, according to the DeKalb County, Georgia, Sheriff’s Office. According to the arrest warrant, Nzinga was detained after trying to pawn a semi-automatic handgun at pawn shop. He had been convicted last month for felony deposit account fraud. On March 25, Nzinga announced on CNN that his group was offering a $10,000 reward for the “capture” of George Zimmerman, the man who reportedly shot and killed Trayvon Martin, an African-American teenager in Florida, last month. Nzinga regularly encourages militant action as a legitimate response to the ills plaguing the African-American community. During a January 2009 radio interview, he asserted that African-Americans must defend themselves against perceived exploitation and oppression, even if it entails resorting to violence. "I got the right to defend my house I got the right bear arms and I got the right to protect myself," he said. Nzinga has accused Jews of having disproportionate power over the media and entertainment industries, which he asserted was achieved by exploiting alliances with Blacks during the Civil Rights era. Nzinga's conspiratorial view of the world is apparent in other theories he has advanced in speeches and interviews. For example, he has asserted that Jews had foreknowledge of September 11 attacks during a September 2005 appearance on Hannity & Colmes. 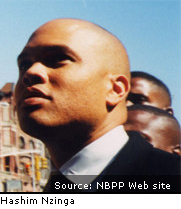 He has also accused “white-run” U.S. government agencies of infiltrating and plotting to "destroy" the NBPP. Nzinga's tenure with the NBPP can be traced back to 1994, when he met Khalid Muhammad. At that time he became Muhammad's personal assistant, and was later appointed Chief of Staff.